Roland® XV Family of Synthesizers. Control and edit all parameters on all Roland XV Series Synthesizers including the Roland XV-5080, XV-3080, XV-88, XV-5050 and the XV-2020. 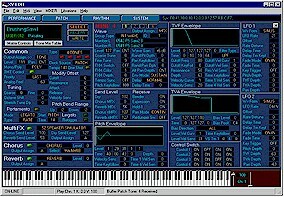 Compact, well designed GUI interface with complete integration with the synth. Every value knob change changes the controls in the editor in real time and vice versa. Full control of all Tones, Patches, Performances and Rhythms in detailed yet user-friendly screens. 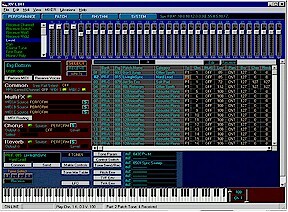 Edit all parameters of all 4 tones in a patch at one time. Mix all 32 channels in performance mode, including panning and effects from one screen. Even edit patches from within performance mode. Patch Librarian: Flexible way to save your patches to librarian files. Quickly and easily browse patches and tones in your library. Patch Genetics: Random Patch Generator - Mix and morph to create an infinite number of patches. Management of all patch creations and performances - Easily save songs on the fly. Support for all Roland SRX and SR-JV80 Expansion Boards. Mix and match rhythm waveforms to create custom kits easily. 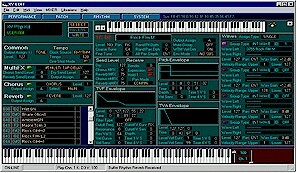 Save kits easily with Rhythm Key Tone Librarian. Detailed editing of all 96 Multieffects - every single parameter. Multieffects, Reverb and Chorus Librarians: Save your effect settings and apply them to Performances, Patches and Rhythms with one click. Full 32-Bit Architecture - Very fast load time and little CPU load. Copy/Paste functions available on many parameters. Cubase Patch Script Generation - automatically create scripts sorted by banks or by patch categories and performance banks. Cubase Drum Map Editor - Generates Cubase Drum Maps (.drm) for any Rhythm Set in the XV Series. Cakewalk/Sonar Instrument Definition Files (.ins) Generation - Creates patch lists and drum maps for Cakewalk and Sonar. Download a free trial or Click here to purchase. All future software updates are free! Send email to xvedit@soundtower.com for more info! Copyright © 2009 SOUNDTOWER INC.